Don’t spend more than you have. If you are putting all your Christmas gifts on credit cards, you’re going to have to pay that debt at some point. If you don’t pay quickly or within the grace period, the interest on the debt is going to eat you alive. Consider spending gifts with whatever cash you have on hand. Save your credit cards for emergencies or purchases that you are going to need for your household expenses and family expenses. Figure out the actual cost of a purchase. For example, if you are purchasing a TV on credit, determine when you actually plan on paying off the full balance of that TV. You may learn that a $500 purchase could wind up costing you $800 or $900 by the time you pay off the debt. Consider spending less on an item knowing full well that with interest you will be paying more than the actual purchase price. Try to put together more thoughtful gifts not necessarily more expensive gifts. If you are able to personalize an item you can get away with spending less. Your family and friends that really care about you will understand if you don’t have money to spend on gifts this Christmas season. I’m sure if you would ask them, they would tell you to limit the amount you spend especially if it was going to put you into greater debt. With all this in mind, it is still possible to have a great holiday season and share gifts with those you desire. Keep in the back of your mind when you’re spending, whether or not you can comfortably make those payments when the credit card bill comes due. If you wind up overspending, the interest fees, late fees, and over limit fees will make it very difficult for you to get on top of the debt. If that happens, you can avail yourself of the federal laws such as chapter 7 or chapter 13 bankruptcy. 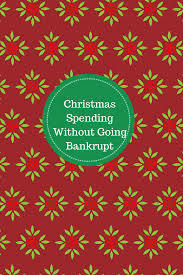 The goal however, should be to enjoy your holiday season without having to be forced into a future bankruptcy.